Frank Hornby (15 May 1863 – 21 September 1936) was an English inventor, businessman and politician. 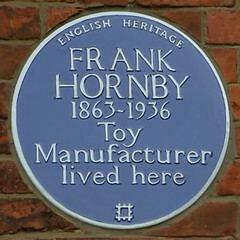 He was a visionary in toy development and manufacture, and although he had no formal engineering training, he was responsible for the invention and production of three of the most popular lines of toys based on engineering principles in the 20th century: Meccano, Hornby Model Railways and Dinky Toys. He also founded the British toy company Meccano Ltd in 1908, and launched a monthly publication, Meccano Magazine in 1916. Hornby's inventions and initiatives made him a millionaire in the 1930s, and he entered politics in 1931 when he was elected as a Conservative MP for the Everton constituency. Hornby's legacy has persisted long after his death with enthusiasts all over the world still building Meccano models and collecting his toys. The 150th anniversary of Hornby's birth was celebrated in Liverpool and Brighton on 15 May 2013.